Baking Powder Drop Biscuits were (and still are) one of my Dad’s favorite desserts — topped with freshly mashed and sugared strawberries… and Cool Whip. He said that when he was a kid, he would sometimes eat a huge bowl of strawberry shortcake (using these baking powder biscuits as the “shortcake”) for his entire dinner before a summer night baseball game. Needless to say, I’ve eaten many of these baking powder biscuits growing up! 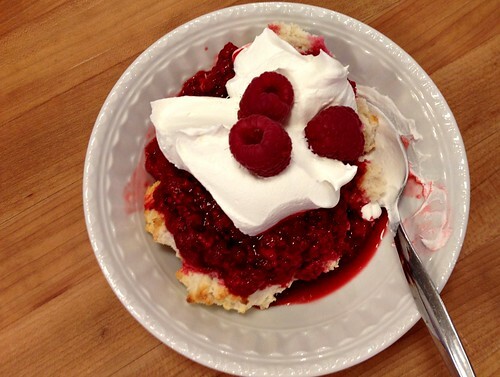 After I met Dave, he said he preferred raspberry shortcake over strawberry shortcake — and the first time I whipped up a batch of baking powder biscuits for his raspberry shortcake, he was hooked. Last week, raspberries were ridiculously cheap at the grocery store — so I stocked up (I bought 22 containers!) 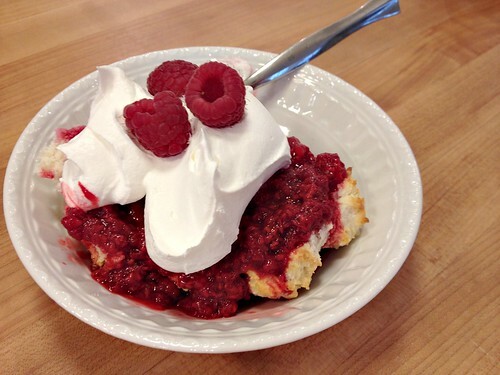 When Dave saw them all, he almost immediately requested raspberry shortcake… and I told him it was on my baking list. The next day, I whipped up baking powder biscuits. As I was making them, I instantly realized how extremely simple this recipe was — as well as how easily it could be adapted to almost every allergy restriction (no eggs for starters!) — so I knew I had to share it here on the blog! It takes me less than 10 minutes to have the biscuits ready for the oven, and I usually mash up the berries while the biscuits bake. I add a little sugar to the berries, open a container of Cool Whip, and dessert is ready! 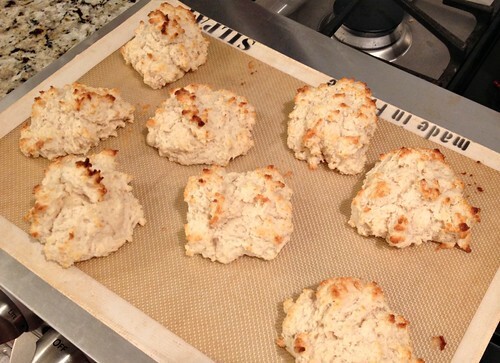 If you’re looking for an impossibly easy dessert recipe that everyone will love, give these baking powder drop biscuits a try. **Note: You could easily substitute gluten-free flour, your favorite “fat” of choice, and non-dairy milk in place of all-purpose flour, shortening, and milk. And you can also omit the sugar altogether depending on your diet. Preheat oven to 450*F. Line a baking sheet with parchment paper or a silpat mat. 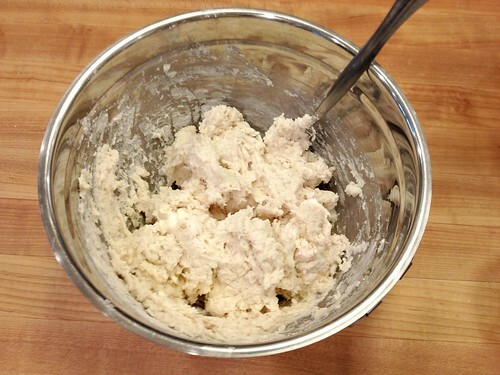 In a medium bowl, mix flour, baking powder, salt, and sugar together. 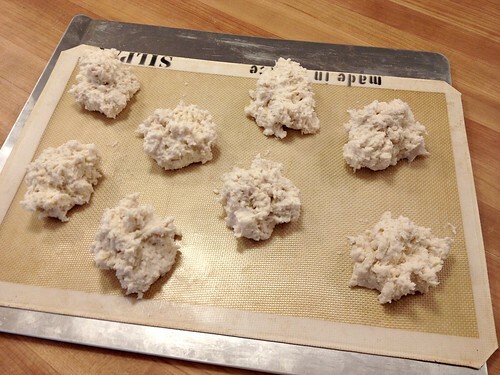 Cut in shortening with a fork or pastry cutter until mixture is crumbly. Add milk and stir until combined (batter will be very thick. We serve our biscuits topped with mashed berries and whipped cream — however, any toppings you love would probably work. Also, if you leave the sugar out, you might consider adding in some herbs and/or cheese to make it more of a savory biscuit that you might eat with a meal. Either way, these baking powder biscuits are a winner around our table! What are your favorite recipes from your childhood? I’m sitting here reading this, while thinking that I’d like something light/small to eat but no idea what, with strawberries and leftover whipped cream in the fridge. I’m now thinking this looks like a fantastic idea for supper. One more thing….the raspberry sale at meijers must have been state wide. I’m in Troy, by Detroit…they were two for $1 here, too. I got in at the end so I could only get 6…..but they were great. Yummy yum! 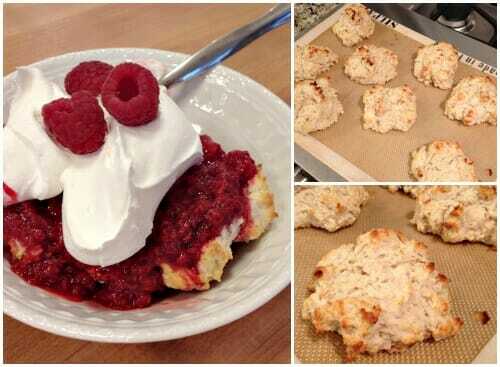 This is almost exactly my go-to biscuit recipe, except I usually do just 1/4 cup shortening (I use palm shortening). I’m glad to know it works as drop biscuits too! And raspberry shortcake sounds and looks amazing. Or, if you only have oil, you can mix the oil in with milk and then pour over the dry ingredients and it’s yummy too. Hi Andrea! I just had to comment because I too bought 22 containers of raspberries at Meijer last week! We ate them plain, with pancakes, in smoothies, and in a pastry, and when we finally got sick of them (if that is possible!) I froze the rest in a couple of freezer bags to use this winter. It was such a fun sale! Thanks for the recipe. I will be pinning it to make with either strawberries or raspberries that I have in the freezer! 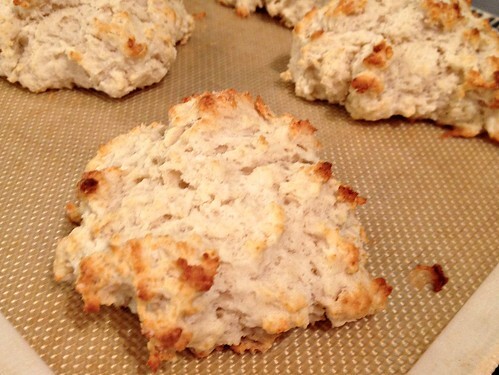 My mom made these drop biscuits all the time, as opposed to rolled. I think her recipe was the Betty Crocker one, too. My fond memory and a favorite was her dumplings. Hers were round, boiled in water and could end up the size of a softball. 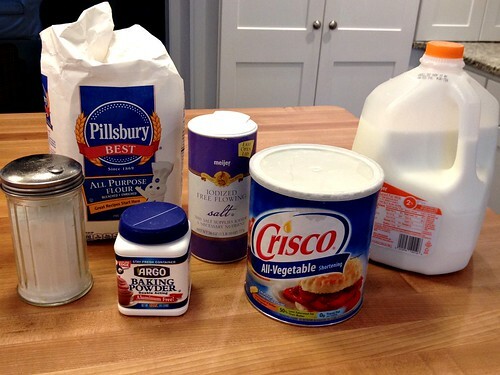 Made with milk (if she had it) or egg (if she had it)….flour, salt and baking powder. If no milk or egg, they just had water. I would love to eat them with just melted margerine…..I have the recipe, but I can’t make them as good as she did. Andrea, just have to tell you how much I enjoy your site!! Have to ask, do you like your Silpat? Thanks Amary! And I LOVE my Silpat mat. I got 2 of them before I was married and have used them weekly ever since! I bet you could use your biscuit base too & it’d be really good too. Ok so they don’t sound that similar, but they look the same :). When I saw your picture, I thought they were the same biscuits. I’m guessing that the Bisquick is probably about the same dry ingredients you had listed. I’m looking forward to trying your recipe to see if it tastes the same. yes, I have made them with Bisquick before (with the cheese too) they are good! And honestly, I think if I added cheese to mine, they would be very similar. We have these at least twice a week as a side. I never thought of using them for dessert! Thanks for the simple idea! I got my recipe from a Betty Crocker Cookbook. The only thing I changed is that that I use butter instead of shortening. I ran out of shortening once and substituted bitter and the biscuits had more moisture and a buttery taste (obviously). If you want to make them into normal biscuits change the milk to 3/4 cup and pat onto counter and cut with a biscuit cutter. I appreciate not having to make my counter a mess so I always do drop biscuits, so much easier! I have also made these for breakfast with home made sausage gravy, and to doctor them up for dinner I have added garlic powder and cheese to taste like the famous Red Lobster biscuits. When I was low on milk I even made them with powder milk. They are super easy and a life saver at our house! Did you substitute an equal amount of butter for the shortening? I’d love to make these tonight, but don’t have shortening on hand! I have also completely melted the butter and added it to the cold milkand stirred. The butter hardens into small little bits in the milk. I then add that to the dry ingredients and stir. The butter is usually evenly distributed throughout the batter. Thanks for the tips Stephanie!